The next time that you visit the interlinkONE offices here at 21 Concord Street, you may notice a new decal at our front door. 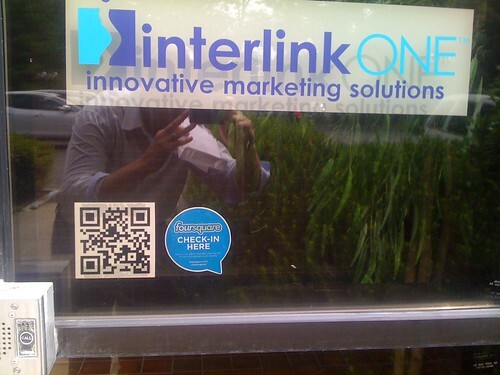 Yes, next to our QR Code is a sign encouraging you to check-in via Foursquare. Foursquare is a location-based service application that helps people share information with their friends. Primarily, this information pertains to where someone is and what they are doing (i.e. “At 1:30 PM, Jason Pinto just checked into Starbucks”). By providing this sort of real-time data, Foursquare helps people to connect with friends and associates that may be in the area. Or, they may simply be exposing a new business to someone who may one day be visiting. From a business perspective, this can very helpful. If someone checks-in to your business, their friends may find out in a variety of ways — via the Foursquare application on their phone, but also on sites such as Twitter and Facebook. Yes, when someone checks-in to your business, the name of your company/location/event will now reach many other people — without you needing to push your message. This type of application may certainly provide more benefits for some businesses than others. For example, if you own a coffee shop, restaurant or a bar, you could truly increase foot traffic with an app such as Foursquare. Throughout the day, each potential visitor and customer at your business could expose your company name to all of their friends, and possibly increase the chances that one of their associates will swing by and make a purchase. Another way that businesses can drive traffic with Foursquare is by offering special promotions. So, should you start to make Foursquare or another location-based service application part of your marketing efforts? This recent article and study may help you to answer some of those questions. The bottom line is this: while usage of applications like this may be small right now, we are all becoming more and more dependent addicted to our smart phones. We are using them to update our social media pages, to text, to read blogs, watch videos, and to find our way to our next spot. Location-based service applications will help us in our daily routines. They may help us to explore and find hidden gems. They may help us to save a bit of money by receiving special deals and discounts. Call me crazy, but I truly believe that more and more people will take advantage of helpful options such as those. If you are a business, you may certainly want to look for ways to take full advantage of this emerging opportunity.